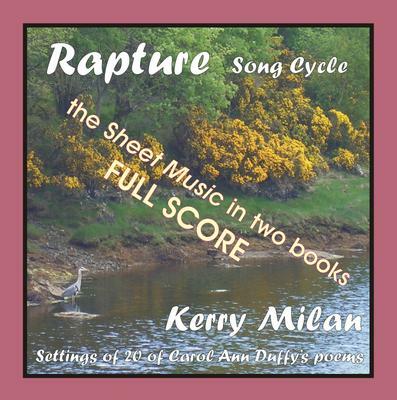 Rapture Song Cycle for Female Voice and Pianoforte: 20 settings of the poetry of Carol Ann Duffy. The Rapture collection is a book-length poem, and a moving act of personal testimony, charting the course of an affair and touching on infatuation, longing, passion, commitment, rancour, separation and grief. It is a contemporary look at an age-old experience. Kerry Milan has set twenty of the fifty two poems, seeking above all to be faithful to the ever-changing spirit of this magnificent work, winner of the 2005 T.S. Eliot Prize. Carol Ann Duffy's book Rapture is published by Picador. But how to set such a captivating range of emotions, changing not just from one poem to the next, but within just a few lines, often with short sentences, each with its own surprising turn of phrase and feeling? This need, to be able to switch suddenly and unexpectedly from one thought or reflection to the next, led to the decision to choose the medium of tone-row music and happily the result has been some hauntingly beautiful music with a contemporary feel and, like the poems themselves, a hopefully universal appeal. The 47 minute work is scheduled for recording in late 2017 by Yvonne Howard and Scott Mitchell. In the meantime, short samples with clarinet and pianoforte at least give a flavour of the pleasures to come - see the downloads comments below. For practical reasons the printed work comes in two books, each with ten settings. In addition, each setting is available as a download, and to accompany each download file the opening lines can be readily viewed and listened to (with the clarinet). What do you want to know about Rapture Song Cycle for Female Voice and Pianoforte: Score?